Opinions on this issue differ sharply by age—with young adults much more likely than their older counterparts to say society is just as well off if people have priorities other than marriage and children. Fully two-thirds of those ages 18 to 29 express this viewpoint, as do 53% of those ages 30 to 49. Among those ages 50 and older, a majority (55%) say society is better off if people make marriage and having children a priority. Not surprisingly, married adults are more likely than those who have never been married to say that society is better off if people prioritize marriage and having children (54% vs. 32%). Among the never married, women are less likely than men to hold this view (28% vs. 35%). Women are slightly more likely than men to say that it’s very important for couples to marry if they plan to spend the rest of their lives together (50% vs. 44%). And blacks and Hispanics are more likely than whites to agree with this sentiment. Again there are large differences by age: Younger adults (those ages 18 to 29) are among the least likely to say it is very important for a couple to marry if they plan to spend their lives together (36% say so). The share saying this is very important increases steadily with age. Among those ages 65 and older, roughly two-thirds (65%) say this is very important. Do Never-Married Adults Want to Get Married? 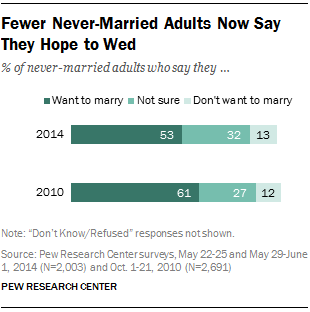 Roughly half (53%) of adults who have never been married say they would like to get married in the future. About a third (32%) say they are not sure if they’d like to get married, and 13% say they do not want to get married. The younger they are, the more likely these adults are to say they want to marry in the future. Among adults younger than 30 who have never been married, 66% say they would like to get married. By comparison, 33% of those ages 30 and older say they would like to marry. Adults who have been married before and are currently divorced, widowed or living with a partner were asked if they want to get married again. About one-in-five of these adults (21%) say they would like to. A plurality (45%) say they do not want to get married again, and an additional 31% are not sure. There is a large gender gap on this question. Women who are currently unmarried but have been married before are much less likely than their male counterparts to say they would like to get married again in the future (15% of women compared with 29% of men). Fully 54% of these women say they are not interested in getting remarried (30% of men say the same). The share of never-married adults who say they would like to marry someday has fallen in recent years. In a 2010 Pew Research survey, 61% of adults who had never been married said they would like to marry someday. The share saying they do not want to marry has not increased significantly since 2010, but a larger percentage now say they are not sure. Today’s never-married adults offer a variety of explanations as to why they are not currently married. Those who have never been married but say either they would like to marry in the future or they are unsure were asked to identify the main reason they are not married. Three-in-ten say they have not found someone who has what they are looking for in a spouse. A similar share (27%) say they are not financially prepared for marriage. And 22% say they are not ready to settle down or are too young. Some 3% volunteered that they are currently in school, and 14% gave some other reason for not being married. Among never-married adults, the reasons for not being married vary significantly across ages groups. For the youngest adults (those ages 18 to 24) the most frequently cited reason is that they are too young or not ready to settle down—33% of never-married adults in this age group say this is the main reason they are not married. Relatively few never-married adults ages 25 to 34 (13%) or ages 35 or older (11%) say this is the main reason they are not married. 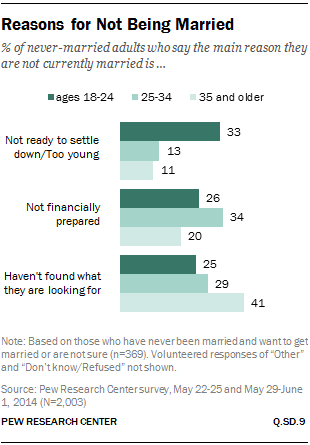 Never-married adults ages 25 to 34 are more likely than their older counterparts to say the main reason they are not married is that they are not financially prepared. About a third (34%) of 25- to 34-year-olds point to this as the main reason they are not married, as do 26% of those ages 18 to 24. Among those ages 35 and older, 20% say this is the main reason they are not married. Four-in-ten (41%) older never-married adults (those ages 35 and older), say the main reason they are not married is that they have not found someone who has what they are looking for in a spouse. About three-in-ten (27%) of those under age 35 say the same. Educational attainment is also related to reasons for not being married. Never-married adults who have not attended college are twice as likely as never-married college graduates to say the main reason they are not married is that they are not financially prepared (35% vs. 18%). Those who have some college education but do not have a bachelor’s degree are similar to college graduates in this regard: 21% say not being financially prepared is the main reason they are not married. The Pew Research survey also examined the importance of several factors in choosing a spouse. Married adults were asked how important these things were to them in choosing a spouse or partner, and unmarried respondents were asked how important these factors would be to them in choosing a spouse or partner. 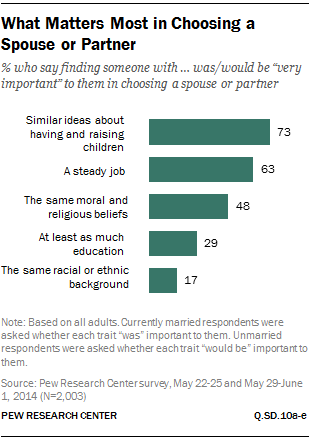 Overall, the public places the greatest importance on finding someone who has similar ideas about having and raising children: 73% say this is very important in choosing a spouse or partner. Coming in a close second is finding someone who has a steady job. Some 63% of all adults consider this a very important factor in finding a spouse. Roughly half (48%) place a high degree of importance on having a spouse or partner who shares their moral and religious beliefs. Finding someone with a similar educational background is viewed as less important than these other factors (29% say it is very important to them). And finding a spouse or partner with the same racial or ethnic background is even less important (17%). Married adults have a different perspective on some of these qualities, compared with those who have never been married but may want to be. When it comes to choosing a spouse, married adults place more importance on having similar ideas about raising children, sharing the same religious and moral beliefs, and having a similar race or ethnic background. 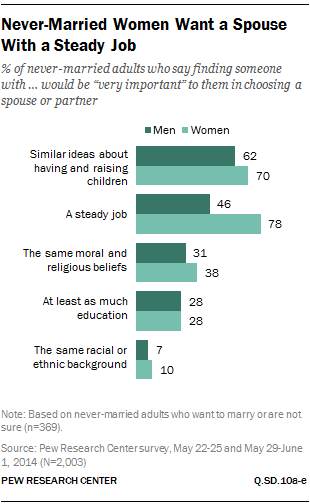 Among never-married adults who may want to marry in the future, 65% say having similar ideas about child rearing is a very important quality in a spouse or partner, and 59% say the same about having a steady job. There is a large gender gap on this item. Roughly eight-in-ten never-married women (78%) say it’s very important that a spouse have a steady job. Only 46% of never-married men agree. Never-married men and women are largely in agreement when it comes to the other qualities or characteristics tested in the poll. Among all adults—married or unmarried—there are some significant differences across racial and ethnic groups on which traits are most desirable in a spouse or partner. Whites (59%) are significantly less likely than blacks (77%) or Hispanics (74%) to place a high priority on finding a spouse or partner with a steady job. Whites are also much less likely than blacks or Hispanics to say that finding a spouse or partner with at least as much education as they have is very important to them. Only about one-in-four (23%) whites say this is very important compared with at least four-in-ten blacks and Hispanics. Compared with whites and Hispanics, blacks place less importance on finding a spouse who shares their racial or ethnic background. Only 11% of blacks say this is very important to them, significantly lower than the share of whites (18%) or Hispanics (24%) who say the same.